We first bumped into a variation on this recipe while surfing outdoor shows on cable and seeing an upland preserve's chef use it to prepare chunks of chukar partridge breast as an appetizer for his guests. The notion stuck with us, and while enjoying a January quail hunt at Virginia's Southbound Sporting Preserve, we found ourselves itching to elbow into their kitchen and add a surprise first course to an after-hunt dinner. You can use most any game bird breast meat in this way. For each served appetizer, half a dove, quail, or woodcock breast will do nicely, but with meat from bigger birds like grouse, pheasant or partridge, you'll probably want to trim the breast halves down to quarters. The result is especially appealing because it keeps that lean bird meat nice and juicy, and is easy enough to fix even when you've been on your feet behind your bird dogs all day. It's a quick, easy, and delicous way to enjoy your day's quarry. Boneless quail breast halves. It may help to review our illustrated tip page on How To Bone A Game Bird. If the bacon is sliced thick cook it in a microwave for 3 minutes (just long enough so that you can finish cooking them in a 400 degree oven with the quail, without overcooking the quail). 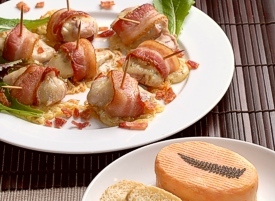 If you have thinly sliced bacon there is no need to pre-cook -- just prepare the appetizers and pop them into the oven. To cut down on the dirty pan factor, layer several pieces of paper towel on a plate and place the bacon stips closely together, cover with another paper towel to catch the spatter. Place a slice of the Pepper Jack cheese on top of one quail breast halve and wrap a piece of bacon once around securing it with a toothpick. Place (cheese side up) on a lightly oiled pan (baking sheet will work fine if it has raised edges to prevent any excess oil from the cheese and bacon from dripping into the oven). Bake at 400 degrees until the cheese bubbles and the quail meat is cooked - about 15-20 minutes. Note that we've seen a variation on this recipe prepared with plain Monterey Jack or Cheddar cheese and slices of jalapeno pepper. The Pepper Jack is usually a bit milder than using the fresh hot peppers. If you've made the milder approach, you might want to try these with a crisp dry white wine.